BEIRUT: Marada Movement leader Sleiman Frangieh has said that the political crisis in Lebanon is a presidential election battle and not an electoral law debate, adding that the new presidential term didn't achieve its purpose. "This is a presidential battle and not one to restore the rights of Christians," Frangieh, the former presidential candidate, said in a talk show aired on LBCI Thursday evening. Frangieh warned of failing to agree on a vote law and dragging the country into vacuum, adding that "no sustainable changes have occurred" after the election of President Michel Aoun as the country's 13th president after an almost two and a half year vacuum. He called for agreement among rival parties to avert a "catastrophe." Politicians are still scrambling to agree on a new vote law. "We have fought a fierce battle for over 10 years to elect a strong president, but when the strong president arrived we didn't see any changes. The country didn't advance in the past six months," Frangieh said. Frangieh, who ran against Aoun in the presidential race, said that "Aoun was a symbol of change and reform but what we are seeing doesn't meet our aspirations." FThe Marada chief said that the best solution to the electoral law deadlock is to agree on a vote law and conduct the elections within three months. He expressed his vehement support for a proportional system "because we believe in partnership." Frangieh told his interviewer that rivals are afraid to adopt the Orthodox vote law. The Orthodox Gathering Law, as it is called, was proposed in 2012 by former Deputy Speaker Elie Ferzli, and was supported mainly by the FPM. It essentially calls for each sect to elect its own MPs within the country as a single district. Critics, however, said it would aggravate sectarian divisions in the country.The Marada leader also blasted Foreign Minister Gebran Bassil sectarian-based qualification vote proposal. "Bassil doesn't want to take the stairs one step at a time ... He is working on isolating or ending any competition." He said that Bassil had proposed the same vote law since 2005 but with different forms. "They want to fix a vote law that suits them." President Michel Aoun and Prime Minister Saad Hariri signed a decree Thursday in front of an audience of over 1,000 members of the Lebanese diaspora with the aim of encouraging them to reclaim their Lebanese citizenship. The decree was signed as part of the fourth annual Lebanese Diaspora Energy Conference, hosted by the Foreign Ministry. At the Cabinet meeting following the event, Aoun, Hariri and Interior Minister Nouhad Machnouk officially granted Nazih Mikhael Khazzaka Lebanese citizenship, the first diaspora member to gain a passport under Law 441, passed in 2015. Speaking at the event held at the Beirut International Exhibition and Leisure Center, Aoun told conference attendees, “You belong to a small nation on the coast of the Mediterranean Sea whose geographical footprint doesn’t even allow for its name to be written completely across a map.” Aoun rhetorically asked, “What is greater than returning to the motherland to which you belong?” The President went on to say it is the duty of the diaspora to help rebuild Lebanon. “Just as it is your duty to be loyal to the nations that took you in and granted you a better life, and which you helped build ... it is also your duty to be loyal to your motherland that calls on you to also help build it,” Aoun said. Also at the conference, Foreign Minister Gebran Bassil renewed calls for a number of parliamentary seats to be allocated for the diaspora. “It is your right to have MPs that represent you and that is why we are fighting to have six seats in our Parliament [for you], one for each continent. ... Stay Lebanese,” Bassil said. Some members of the Lebanese diaspora were visiting the country for the first time to attend the conference. A group of around 10 Argentines of Lebanese origin sat together, with one woman telling The Daily Star this was her first time in the country. “After attending the LDE conference in Sao Paulo [last year], I decided to come to this year’s conference in Beirut,” she said. The columns are among the vast wealth of ancient Roman, Phoenician, Persian, Greek, Byzantine, and Ottoman objects found during archaeological digs in Beirut between 1993 and 1997. The columns were originally stockpiled in a storage facility belonging to Solidere — the company created in 1994 to rebuild central Beirut after the end of Lebanon’s bloody, 15-year-long Civil War — under the direction of archaeologist Hans Curvers. Solidere had originally planned to distribute them in green spaces throughout the city, including its largest public park, Horsh Beirut, which partially reopened in 2015 after being closed for 20 years. However, with major infrastructure work underway in the Biel district, the warehouse had to be dismantled and the columns were moved to the nearest available space: vacant real estate near a waterfront promenade. 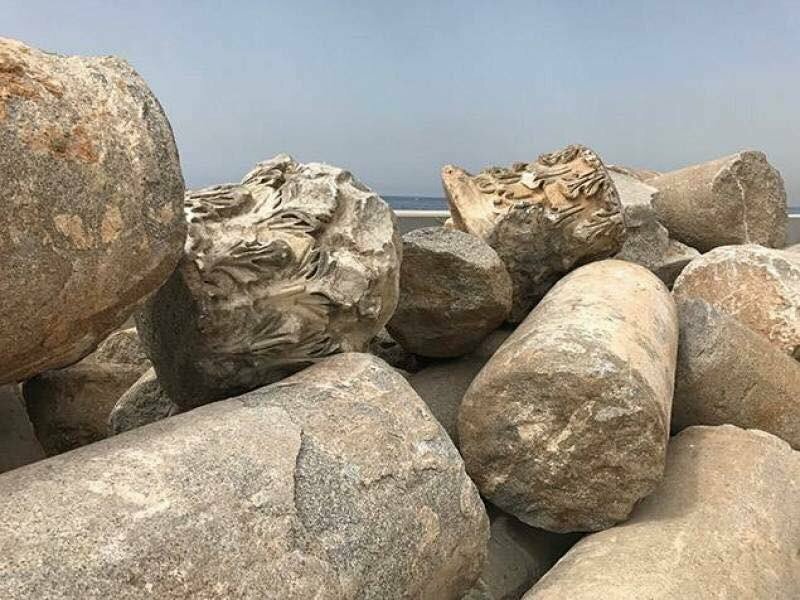 The GDA spokesperson assured L’Orient Du Jour that the columns are safe and, because they are made of limestone and basalt, do not risk degradation from being left unattended near the waterfront. Romans invaded Beirut (then known as Berytus) in 64 BCE, and it remained one of the most important cities in the eastern Roman Empire until a series of devastating earthquakes in the middle of the 6th century CE. Its Roman infrastructure and institutions included a grand gate, a forum, a renowned law school, and a hippodrome. The latter was controversially dismantled to make way for a luxury real estate development. Will Lebanon's president keep parliament from 're-electing' itself? Minutes after Aoun announced his decision, Berri set another session for May 15. In the meantime, Lebanese political forces continue their quest to agree on an electoral law by then. Simon Abi Ramia, a member of parliament's Change and Reform bloc, told Al-Monitor that despite differences between the parties, political forces seek to agree on a new electoral law and his political bloc will strive to prevent a parliamentary extension by all means. Aoun wants to replace the contested 1960 Electoral Law, which is based on a majoritarian (winner-take-all) district electoral system with limited exceptions. That law allows Muslim leaders to select Christian parliament members in some constituencies. Aoun, a Maronite Christian, along with Hezbollah and the Amal Movement, are insisting on a "total proportionality" system, while others want either a hybrid law or the majoritarian system. On the eve of April 13, the date set for the session to discuss the extension, the specter of civil war came back to haunt the Lebanese amid a sharp division of political forces and a serious threat by Christian political forces to take to the streets to prevent the session. They threatened to block the roads to prevent legislators from even reaching parliament. Many years ago Lebanese journalism had always maintained a “reputation for excellence” and accordingly had a luster as a center of journalism. Historically, Lebanon was the first country in the region to have newspaper publishing, where the first was published in 1858. In the first half of the 20th century, hundreds of newspapers were published across the country, giving Lebanon its unique role in bridging East and West and making the history of the Lebanese press surrounded by analysts all over the Middle East. Press Martyrs’ Day is an occasion that has been commemorated on May 6 in public and private spheres throughout the country for many decades to honor journalists and activists killed in the name of free speech. This occasion has always been a great opportunity to salute the Lebanese press and to praise the country’s media. It is a catalyst of hope to foster freedom and democracy and an eternal remembrance of journalists who sacrificed their lives for the country to survive and for the Lebanese people to live in peace. How did the Lebanese press assist the state in highlighting challenges and opportunities? Journalism in Lebanon has always been at the forefront of promoting social and political change. Twenty years ago Lebanon Opportunities, a leading business magazine, had “dreams abound of a modern country, fair to its citizens, hospitable to its returning or visiting expatriates and to tourists, enabling business to thrive and protecting the weak strata of its people” and committed itself to the “side of doers” as stated in the special anniversary issue of Lebanon Opportunities. For 20 years, Lebanon Opportunities published every month, a magazine about “what is working, how it is done, where the opportunities are and how to face obstacles,” as presented by its publisher and editor-in-chief, Ramzi el-Hafez. Few words say everything about the hard work that has been delivering optimism and investing in hope throughout the last two decades. The 20th anniversary issue takes us in a “journey” of fulfilling a national promise of progress and development, backed up by statistics, analyzed and visualized data, generating a story of social change with strong impact on engaging audiences and promoting civic activism. It compares in a real and figurative sense the situation at the time the magazine started in 1997 with today’s situation, highlighting major national achievements in addition to emphasizing measures of success and failure.